(A) Votive Masses are always optional; they are never obligatory. Votive Masses are generally of the 4th class. They should not be offered on a liturgical day of the 1st or 2nd class. They should not be offered on a liturgical day of the 3rd class unless there applies one of the exceptions noted under (D) below. 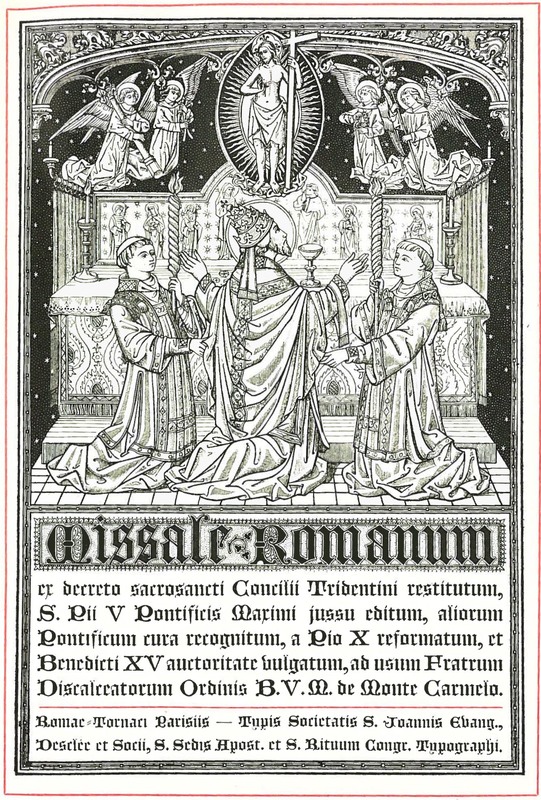 (B) The Missale Romanum (1962) contains many votive Masses. This page contains Propers for the ones that are most frequently offered, but additional choices are available. (D) The exceptions mentioned in (A) above, are as follows. The exceptions do not apply on liturgical days of the 1st or 2nd class. During Advent, the Mass Roráte cœli désuper is a votive Mass of the 3rd class and may be offered on any liturgical day which is not of the 1st or 2nd class. A votive Mass may be offered on any day by indult (i.e., special permission granted by competent ecclesial authority). (E) The Mass “Saturday of Our Lady” is not technically a votive Mass, but it is included on this page for convenience. It is of the 4th class, and it is proper to every Saturday of the year which is not a liturgical day of the 1st, 2nd or 3rd class. On a Saturday when this Mass is proper, if a 4th class commemoration also falls on that date, the Priest may either offer the Mass “Saturday of Our Lady” and include that commemoration, or he may choose to offer the Mass from the Proper of Saints which corresponds to that commemoration. Note, however, that on the first Saturday of a month, the Priest may choose to offer, instead of this Mass, the votive Mass of Our Lord Jesus Christ, Supreme and Eternal Priest under the conditions described in D.1. above, or the votive Mass of the Immaculate Heart of the Blessed Virgin Mary under the conditions described in D.3. above. (F) The “Daily Mass for the Dead – For All the Faithful Departed” is of the 3rd class from November 3 through November 8, and on those dates it may be offered on any liturgical day of the 3rd or 4th class. On other days of the year, it is of the 4th class and can only be offered on 4th class ferias.